I was talking to a fellow pregnant woman recently who shared with me her frustrating habit of overconsumption, which I could completely relate to. Nutrition is so difficult for me when I’m pregnant, and I’m constantly attempting (and usually failing) to fight my cravings. I instantly felt a kindred spirit with this woman, a sisterhood of sorts. That was until she told me her big downfall: Oranges. She couldn’t stop eating oranges. Ya, we can’t be friends anymore. I’m more of a fried Chinese food and ice cream kind of girl. I don’t know what it is about these babies of mine (if you missed the news on Facebook, it’s officially BOY #4 for us!) but they like fried food. And what’s better than crispy fried chunks of chicken drenched in sticky sweet sauce? 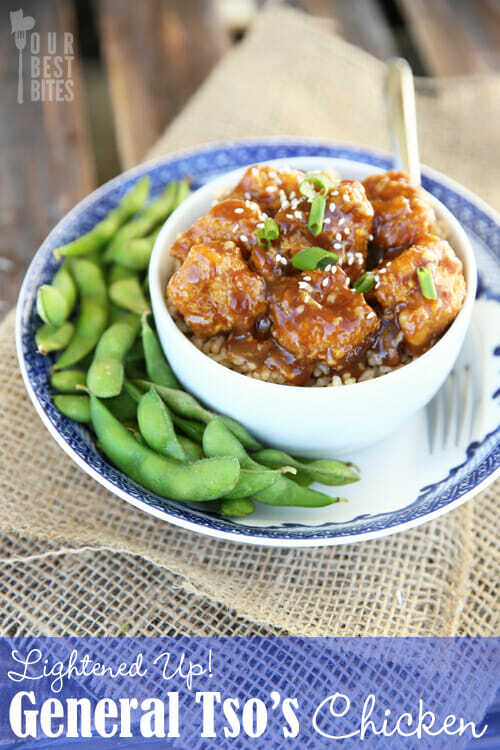 General Tso’s has been a long-time favorite take-out item of mine, so I was excited to try this lightened up version, and it didn’t disappoint. 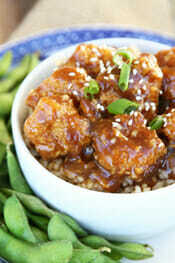 Super crispy chicken, awesome, flavorful sauce (that’s SO easy to make), and happy kids all around. This was an instant hit at my house, and I bet it will be at yours, too! There are a lot of things you can use to bread chicken with a crispy coating, and in this recipe, we’re using good ol’ Corn Flakes. It really does make a super crisp outer layer, and it holds up in a sauce better than more delicate options like Panko or bread crumbs. You’ll need to prep three dredging bowls: egg whites, flour, and crushed corn flakes. 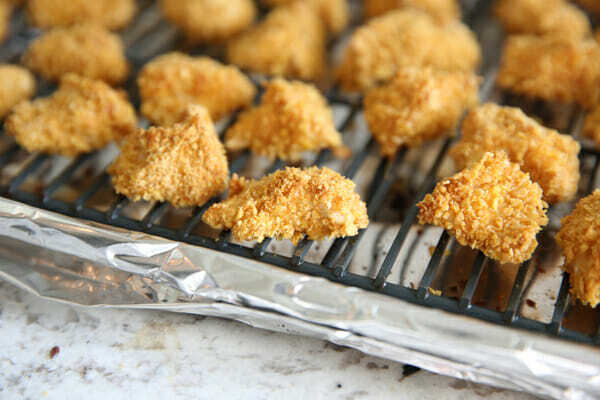 Dip your chunks of chicken in the flour, then the egg whites, and then finally the corn flakes. Place them on a metal rack on top of a baking sheet. The rack makes it so air can circulate around the bottom and get those little pieces crispy all over. 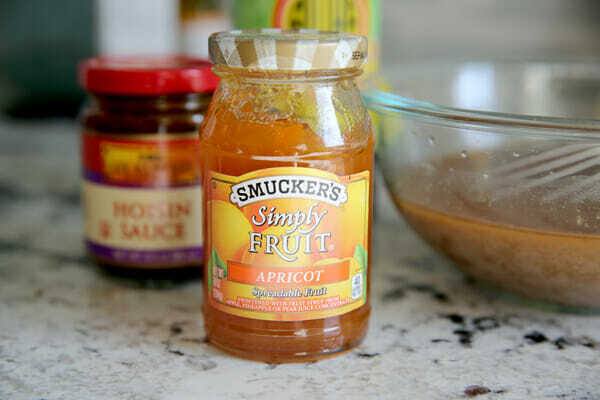 While the chicken is in the oven baking, you make the super quick sauce. Mince up some garlic, fresh ginger, and toss some red pepper flakes in there. If you like spicy food, add extra pepper flakes, or a few squirts of Sriracha. Or sauté the garlic and ginger in our Chili Olive Oil. 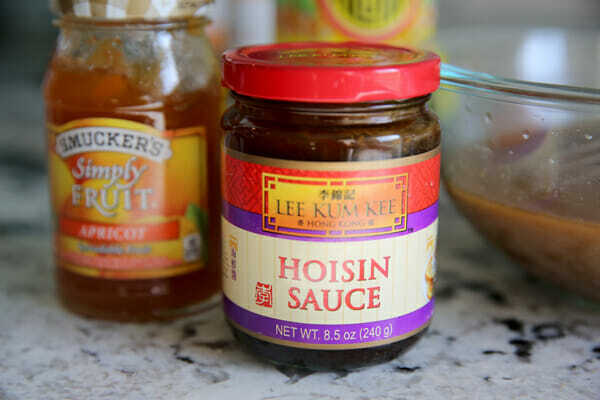 You’ll also need hoisin sauce, which you should be able to easily find in the Asian foods aisle of the grocery store. It lasts a long time in the fridge, so don’t hesitate to buy it just for this recipe. It’s great in lots of Asian dishes. 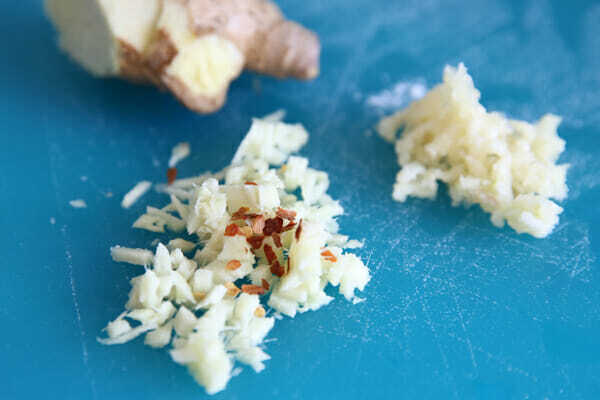 You’ll just sauté the garlic, ginger, and chili flakes for a minute, then add in a mixture of the jam, hoisin sauce, water, soy sauce, and a splash of balsamic vinegar. It’s thickened with a little corn starch. The chicken bites cook quickly, and come out super crunchy. Toss it with the sauce, serve over brown or white rice, and dinner is done! This totally quenched my take-out cravings; it’s the perfect weeknight dinner. Pin this baby right now- you’ll thank me later! Adjust oven rack to upper-middle position and heat oven to 475 degrees. Line rimmed baking sheet with foil, top with wire rack, and spray rack with oil spray. Spread flour into shallow dish. Whisk egg whites until foamy in second shallow dish. 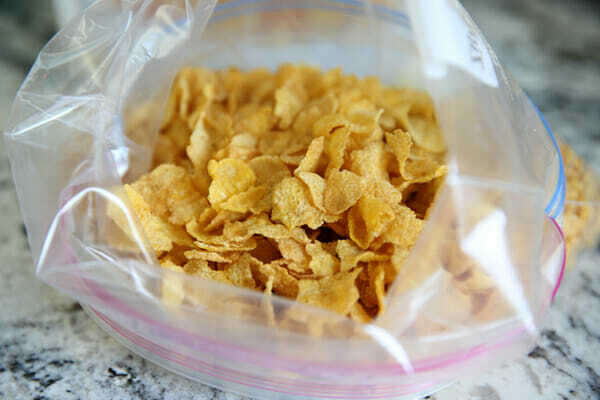 Spread corn flakes crumbs into third shallow dish. Pat chicken dry with paper towels. 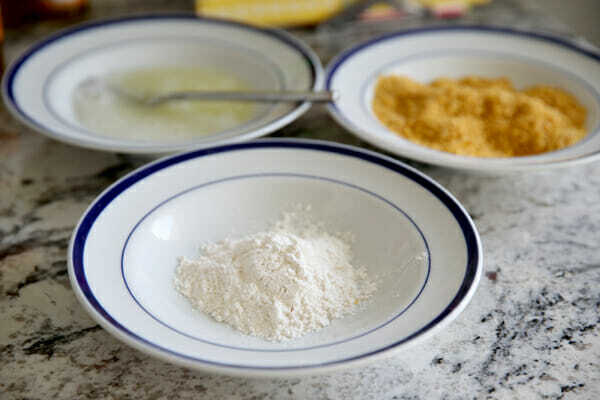 Working in batches, dredge chicken in flour, dip in egg whites, then coat with corn flakes, pressing gently to adhere; lay on prepared wire rack. Spray chicken with oil spray. 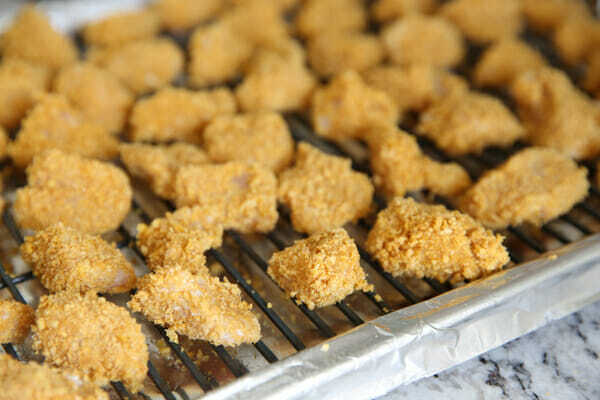 Bake until chicken registers 160 degrees and coating is brown and crisp, 12-15 minutes. Meanwhile, whisk water, soy sauce, apricot jam, hoisin, cornstarch, and vinegar together in bowl. Heat oil in 12 inch skillet over medium heat until shimmering. Add garlic, finer, and pepper flakes and cook until fragrant, about 1 minute. Whisk in soy sauce mixture, bring to simmer, and cook until thickened, about 2 minutes. remove from heat, cover, and keep warm. When chicken is cooked, return sauce to simmer over medium-low heat. Add cooked chicken and toss to coat. Serve immediately, as the crispy coating won’t last long-term in that yummy sauce. Overindulgence isn’t just a problem when I’m pregnant…it’s a problem ALL MY DAYZZZ. Love this. And congratulations on another baby boy! Oh those comments started the moment I announced a pregnancy. Everyone who knows me knows how crazy I go on that topic, don’t even get me started, lol! So making this tonight! Yum! And thank you for all your hard work! Seriously- 3 kids, growing another, running a business, tending a garden ( I know how much work that alone is)!!! You’re a rock star! Congrats! A boy! Four boys! I’m a mom of four boys(no girls) too! They are so much fun! I grew up with only sisters so I do get shocked quite often by their “boy-ness”, but I sure do love them! I always feel like I meet a kindred spirit when I find a mom with all boys. Congratulations again, Brothers are the best! Hope the rest of your pregnancy goes well and fast! Oh and I’m totally excited to try this dinner! hahaha I totally agree with you, I have a secret resentment against people who crave healthy food when they’re pregnant. I tend to throw up salad and bell peppers and whole-wheat cereal, and In-N-Out burgers just seem to be the only acceptable replacement. This recipe looks amazing, though! Going in my meal plan for the week right now! Yum! 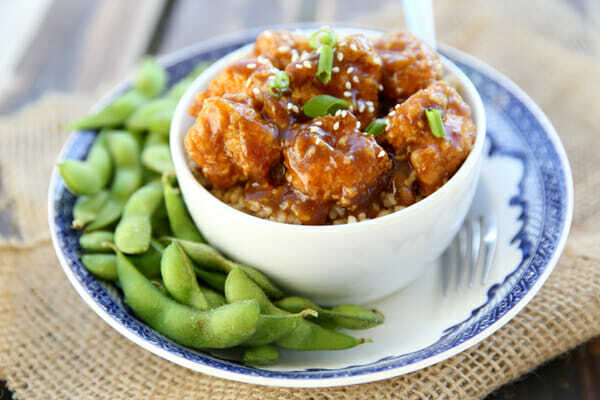 General Tso’s is one of our favorites! Totally need to try this. Thanks! I love a recipe where you can spritz with oil and bake instead of frying. This looks like a great one. I have 4 boys and just had my first girl. From the second I found out #4 was a boy people would ask when we were trying again. While I did want a daughter, I wasn’t just having babies to get a girl. And this time even after 3 clear ultrasounds we were still sure we were having boy #5 up until I pushed out a girl. Lol. But we also moved 18 months ago from southeast Idaho to Reno and it’s not normal for people to have big families here. We’ve had people roll their eyes in the stores, and even a lady tell us we had way too many kids. I think there are just those people out there that enjoy irritating others! For me it was BLACK PLUMS the first time. I was eating 6-8 a day for weeks! Thank goodness they were in season. Pregnancy #2 was Drumsticks, the ice cream cone confection. YUM! Guess which pregnancy gained me 30# and which gave me 70# LOL? My dh loves General Tso’s chicken. Thanks so much for the recipe. I hate frying up all those little pieces. Can’t wait to try it. I made this immediately after seeing your post. It’s so perfect it’s going into the regular recipe rotation! Sarah, Thanks for another amazing dinner! You (and Kate) taught me how to cook and love it. You’re the best! We can be friends:). I’m pregnant with #3 and I always crave the junk. Now I want a cheeseburger and fries after reading a comment about in and out burger. This dinner looks fantastic! I think my kids would actually love it too. I hope your pregnancy continues going well and congrats on a boy! How fun will 4 boys be, wild but fun!!! Congrats on Baby boy #4!! I’m a 4 boy only mom too! Like Nichole, I don’t know how many people asked if we were going to “try again” while I was still pregnant (and even still now as I’m not.) Thanks for being so nosy stranger! Do you ask every pregnant person this in the checkout line? Or “one more boy and you’ll have a basketball team!” Wow. Original. First time I’ve heard it. BTW, if it was a girl, couldn’t she play basketball too? Or how about, “Good for you, girls are nothing but drama.” Hmmm…I’m a girl…and I’m pretty nice! So, now, as people still are compelled to comment (baby is three years old), I respond with “I love it! It’s a party at our house!” Usually that quiets the people who must say something. I do get compliments on them too (when they are acting well behaved), so I guess not everyone is negative. Honestly, I think it is usually an ice breaker for people to start a conversation with, like the weather. Enjoy the ride! Wow this looks easy enough for me to make! I had to comment I am also pregnant right now with BOY #4 for me too! How awesome is that! I can totally understand the junk food cravings right now…hello ice cream! 😉 Thanks for this recipe! I’m having a problem saving some of your recipes. When I click on the save recipe button it tells me it has saved southwestern brown rice salad. It’s done that about 6 times now on various recipes. Any idea what’s happening? I’m sorry- that’s an issue with a third party app (ziplist) so we have no control over it. I’ll try and submit a request to fix it! Can you substitute the balsamic vinegar with rice or apple cider vinegar? Totally different flavor profile (the balsamic here is adding sweetness and richness) but in a pinch you could leave it out. Congratulations on your next baby boy! I raised all boys, too, and we just got to meet our third grandson who joins his sister, who is the only granddaughter we’ll ever have. I recently tried making sweet and sour chicken using cornflakes and baking the chicken instead of my usual method. We found it more tough than crisp, and vowed to never do that again. The flavor wasn’t “authentic” tasting, either. Congrats on boy#4! So exciting! I have 5 and boys and no girls, so I may be a little biased, but I think boys are definitely the way to go! Hi! I was wondering if I could freeze the chicken after breading, or maybe even after baking, and freeze the sauce separately? Do you think it could work as a freezer meal? Loved this recipe. It’s a little time consuming. But it’s easy. I used my left hand for the flour and egg white part and then my right hand for the cornflakes. That prevented from getting my hands really dirty and having to stop and wipe them off. I’d recommend throwing in some vegetables with the chicken. We tried shoe string zucchini and carrots and then a little broccoli. Yummy! This looks like another amazing recipe to try. I never thought about using Corn Flakes instead of bread crumbs. I made this for dinner tonight, with halibut instead of chicken. I served it over fried rice. My family loved it! I will definitely make this again. This took me forever to prepare, and I needed 4 hands to do it all! Not sure how I would get it done in 30 minutes by myself. Just FYI for those home cooks out there.